With Penn State and Notre Dame on the horizon, DePaul (2-0) made sure they would head into those two games on a high note with a comfortable 91-63 victory over Morgan State (0-3) Monday night at Wintrust Arena. DePaul grabbed control of the game with an early 17-2 run that helped them open a 20-6 lead just eight minutes into the first half. 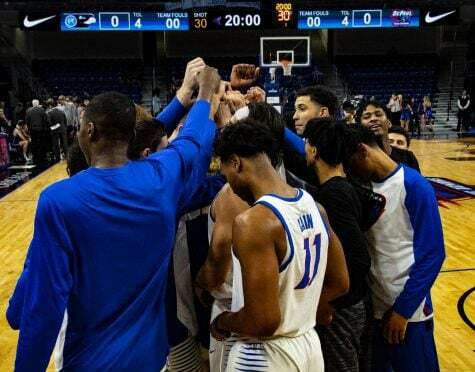 After Morgan State hung around for much of the first half, the Blue Demons closed out the opening half on a 13-3 run over the final four minutes and 20 seconds to take a 39-20 lead to the half. 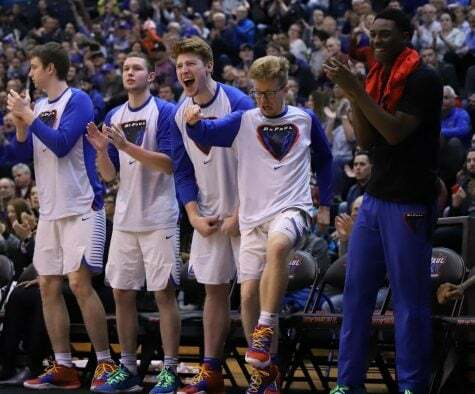 From there the Blue Demons wouldn’t look back open as much as 35-point lead in the second half. 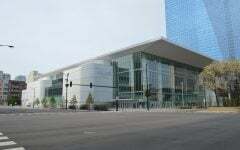 After all was said and done, one of the first things DePaul head coach Dave Leitao looked at was the assist line. He liked what he saw with 21 assists on 35 made baskets. 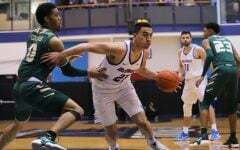 Leitao also pointed to the size disparity inside as something DePaul was able to exploit that never allowed Morgan State to get in a rhythm early on. Coming in, DePaul wanted to force Morgan State into outside shots and handle the pressure they knew was coming. 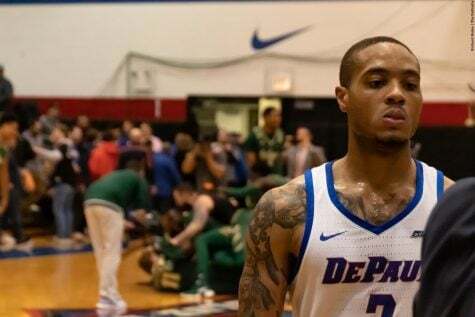 The Blue Demons did both of those things limiting the Bears to just 25.8 percent shooting in the first half, while also capitalizing on the press with 11 fast break points, including four dunks. 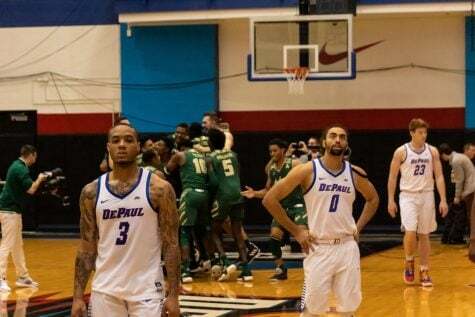 “Keep them out of the paint, get stops on defense that lead to offense we knew they were going to try to speed us up a little bit I thought we did a great job handling the pressure,” DePaul senior guard Max Strus said of the plan coming in. “That starts with Devin but once we got the ball moving guys were just making open shots and that’s infectious when one guy sees another one go down, as tight as we are, when one guy is going it feeds off and everyone feeds off of that so I think that helped out a lot today. 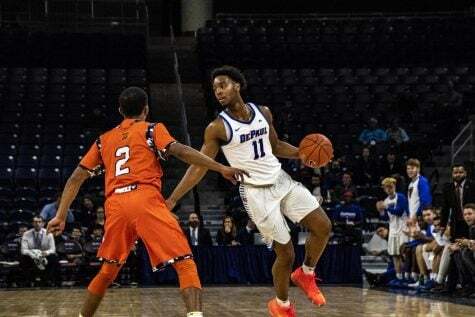 Senior guard Eli Cain played 19 of the possible 20 minutes in the first half and led the Blue Demons in all categories with 11 points, five rebounds and five assists. 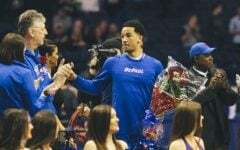 Earlier in the first half, the senior also reached the 1,200 point-mark in his Blue Demon career with two free throws to give DePaul a 26-16 lead. Senior guard Eli Cain dribbles against Morgan State guard Martez Cameron. 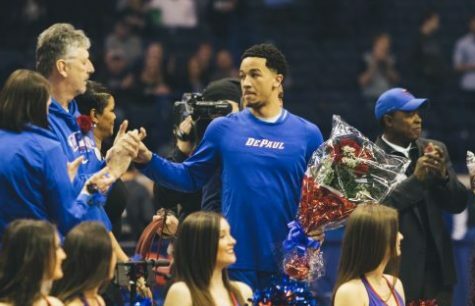 The senior guard from New Jersey was not aware at the time that he had accomplished that feat, but was happy to reach the milestone and credited his teammates for helping him get there. 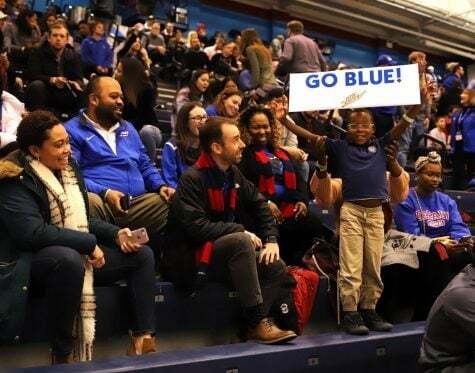 After two uneven performances against Rockhurst and Bethune-Cookman, the Blue Demons played arguably their most complete game so far in the young season with nine players making their way into the scoresheet. 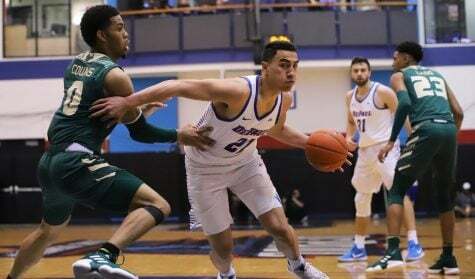 The Blue Demons were paced by Cain who finished with 21 points, eight rebounds and six assists. 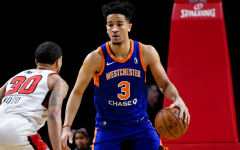 Strus was just as good with 25 points and nine boards. 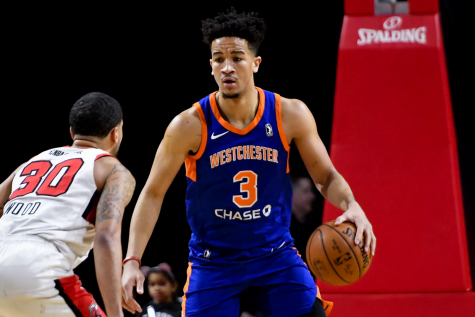 In just his second regular season game back from injury, sophomore Devin Gage also had a bounceback night a career-high 13 points and nine assists. After getting off to a similarly good start last season, Cain praised his point guard for the return he’s made already this season. 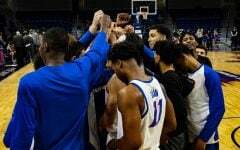 The win marked the first time since the 2014-15 season DePaul had been 2-0 to start the year. 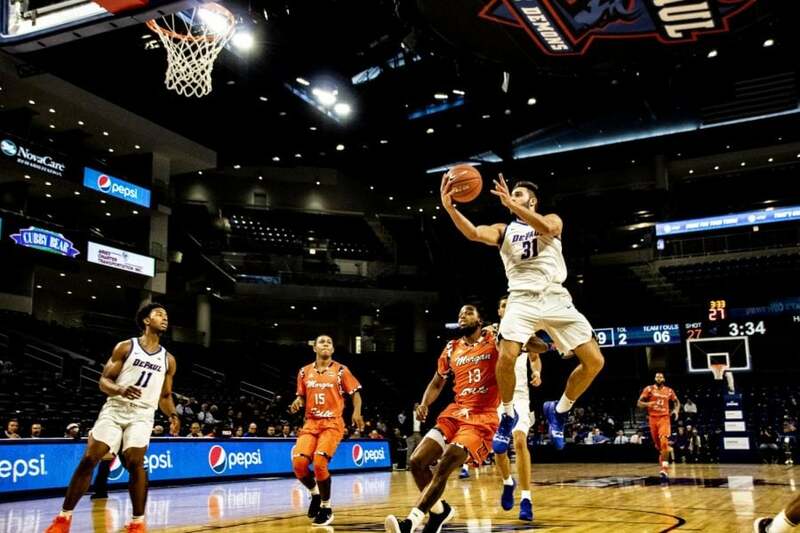 The Blue Demons road gets a little tougher on Thursday when they host Penn St. in the Gavitt Tipoff Games on Thursday night at Wintrust Arena.